Just a few days into the New Year, people are hard at work trying to keep their New Year’s resolutions. They’re working out at the gym, or making a tighter budget, or maybe creating an online dating profile. But this January is also National Train Your Dog Month, so make a resolution to learn something new with your four-legged friend. What Is National Train Your Dog Month? 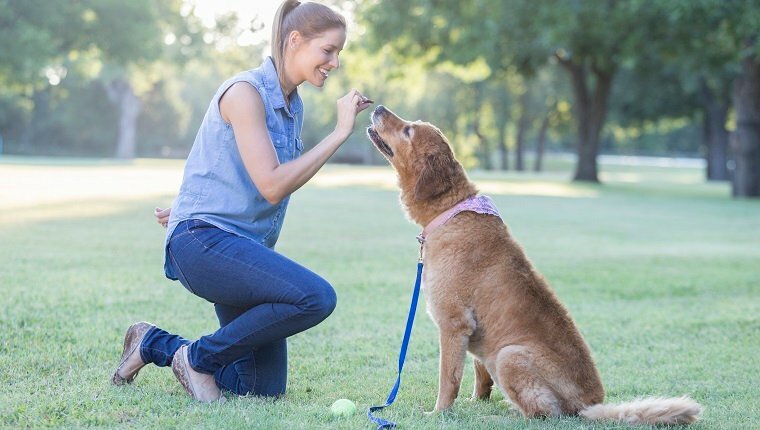 The Association of Pet Dog Trainers (APDT) began their National Train Your Dog Month campaign in January 2010, hoping to raise awareness about the importance of proper pet training and healthy socialization to a dog’s well-being. Why January? Because so many dogs and puppies are adopted around the holidays, and because a good number of those dogs are given up to animal shelters or abandoned soon after. APDT understands training could be the one thing that makes or breaks a dog’s chance to stay with their family and in their home. Though most people who get a dog do so with the best intentions, those who wind up surrendering their new pets to the shelter often do so because they just can’t cope with their dog’s behavioral issues. Maybe the dog is hyperactive, yappy, or destructive. Perhaps they’re fearful, shy, lashing out, or behaving aggressively. Most often, it’s not because they’re bad dogs. It’s because they don’t have the tools they need to know how to behave appropriately. Inexperienced owners might try temporary fixes that only make problems more severe, like isolation from the house and family, yelling, shock collars, or worse. By the time these dogs end up in a shelter, they’re confused and ill-equipped for life in a home. That makes January the perfect month to remind pet parents, new and experienced, to take the time to train their furry friends. With consistency, well-timed praise and rewards, a level head, lots of practice, and the guidance of an experienced dog-training professional, you and your pooch will learn and grow all year long. 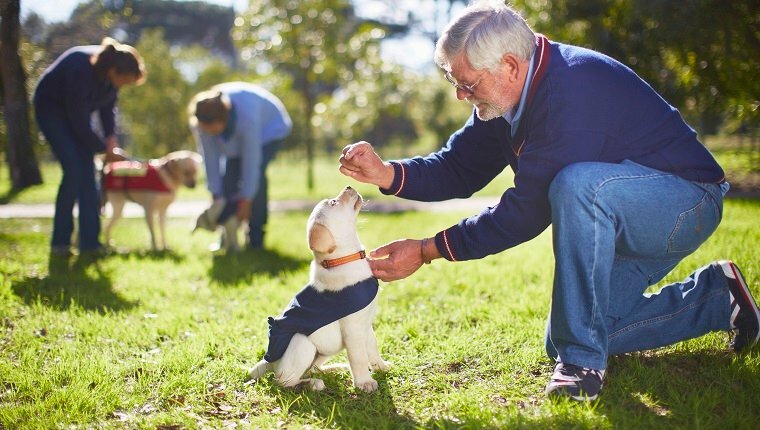 Interested in finding the perfect dog trainer for you and your canine companion? Take the time to do your research. Ask a friend about the training class they took with their dog, or if they can recommend a trainer. Chat with your veterinarian or local rescue organization to see what trainers they vouch for. Word of mouth is a great way to find a trainer you can count on. Visit the websites of one of the several professional and education organizations for dog trainers and use their “find a trainer” databases to locate a reputable professional in your area. Some helpful organizations include the APDT, the International Association of Animal Behavior Consultants (IAABC), the National Association of Dog Obedience Instructors (NADOI), or the Certification Council for Professional Dog Trainers (CCPDT), among others. Do the dogs seem happy? Their owners? Have a quick chat with some of the owners after class to get their overall impression of working with the trainer. What kind of skills will be covered over the duration of the class? What tools will be required (leashes, harnesses, treats, toys, clickers)? Does the instructor emphasize socialization in class? Do the canine participants get a chance to interact with one another? Is the training facility a safe and secure environment for you and your dog? Is the facility clean and sanitary? Does the trainer require proof of vaccinations from his or her students to ensure your dog will join a healthy class? Does the trainer use positive reinforcement techniques and denounce any sort of physical punishment? Talk with the trainer to get an idea of his or her training philosophy. Lastly, remember that training your dog is not only beneficial; it’s also a lot of fun. Dogs thrive on mental stimulation. They love the chance to learn and practice something new. However, more than anything, they will relish the opportunity to bask in your undivided attention as you work toward a common goal together. Time spent training is time spent bonding, making priceless memories, and building a strong relationship between you and your dog. Isn’t that what having a dog is all about? If you would like to learn more about National Train Your Dog Month, then visit the campaign’s website or the Association of Professional Dog Trainers on Facebook today. Do you plan to do some dog training during National Train Your Dog Month? Then let us know what you and your dog are learning in the comments below!